Mommy Mundo takes moms on a mission that’s totally possible! More often than not, moms are on auto-pilot as they go about their daily routine. Prepare breakfast for the kids, check! Pay household bills, check! Arrange birthday party for youngest, check! Help eldest finish his homework, check! Take a minute for some reflection, hmmm, maybe later! So this mother’s month of May, Mommy Mundo encourages moms to go on a journey of mindfulness and self-discovery through EXPO MOM 2015: #MOMMANIFESTO happening on May 22-25 at the Glorietta 2, Palm Drive, Makati City. Now on its 8th year, Expo Mom is the biggest gathering of progressive, active moms showcasing the latest in family-oriented product innovations and parenting trends in a fun, fulfilling environment. 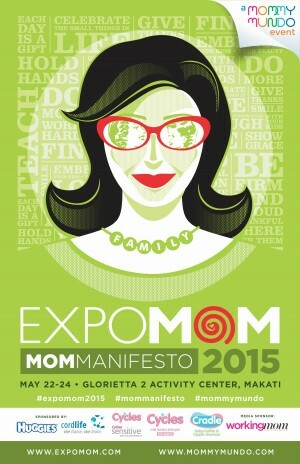 Expo Mom 2015, featuring over 50 booths alongside talks, demos and fun activities onstage, will be a celebration and culmination of this 5-week Mom Manifesto campaign. The Mom Manifesto journey begins on April 22 when it launches online at www.expomom.com/mommanifesto. Designed by Mommy Mundo founder Janice Villanueva and family life expert and certified psychologist Michele Alignay M.A., the workshop consists of a 6-step program to be fulfilled within a five week period, with each step just taking 15 minutes minimum from each mom participant. With self-awareness as a goal by the end of the program, moms will be able to come up with a guiding statement or her #MomManifesto. All participants are oms are invited to post their #MomManifesto statements on the wall that will be set up at Expo Mom 2015. In addition to this key event highlight, moms can also look forward to Expo Mom 2015’s trademark fair of its top mom-approved and mom-tested products and services . The event is particularly proud of giving a home to aspiring and established mompreneurs who have developed products for their fellow moms through the years, exhibiting there goods alongside top mom and baby brands in the country. Expo Mom 2015: #MomManifesto is co-presented by Cordlife Philippines, supported by Huggies, Cycles Mid Detergent, Fern-C, Nurture Nook, Pioneer Insurance, JoomaJam, Wang Videography, ImagineNation Photography, and media partners Working Mom Magazine, Rappler, WheninManila.com, Crossover 105.1, Newlyweds@Work, and venue partner Glorietta and Ayala Center. In lieu of entrance fees, donations in cash and kind (books, school supplies, clothes, shoes) will be accepted at the expo. All proceeds will go to MomShare’s partner beneficiary, Childhope Asia Philippines, to benefit literacy and health programs for street children under its care. Follow updates about #expomom2015 through this website or on the Facebook event page.